Marian McKean Wigglesworth, a pioneer alpine skier in the United States, was one of a dozen women who were chosen to compete in Europe in the late 1930’s. Her performances opened the doors for American women to compete internationally. Marian McKean Wigglesworth was born in Beverly Farms, Mass. on September 13, 1915 and became one of the pioneer alpine skiers in the United States. When Roland Palmedo headed the National Ski Association Competitions Committee, Marian was chosen among a dozen other women to train in Europe against the world’s best women skiers and to compete in the F.I.S. World Championships. 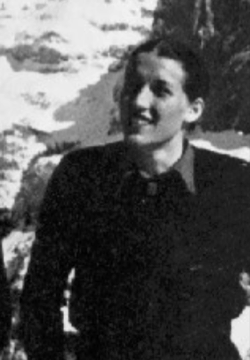 Marian was selected as an alternate on the 1936 Women’s Olympic Alpine team. Although she did not have the opportunity to compete in the games, the European experience gave her the confidence to compete as a member of the United States F.I.S. Women’s Team in 1936, 1937 and 1938. A newcomer to international racing, Marion performed admirably on the European circuit. The events leading up to the F.I.S. at Innsbruck, Austria in 1936 posed an initial obstacle for this neophyte. A tune-up race at Garmisch was held on a particularly difficult course for the inexperienced American women. Dot Brewer took a bad fall on the downhill, crushing a vertebra. The course at Innsbruck was equally tough with an additional handicap: lack of snow. When the men ran first on this “bone-breaker” downhill, racers one through five had to be carried off the course. Because of difficulties in moving the electronic timing system, the women were notified that they would have to run an abbreviated race on the same course. Over the coaches’ protests, the race went on. Betty Woolsey came in seventh but the real surprise was Marian’s ninth place finish in this arduous downhill. Under the leadership of Clarita Heath and Marion McKean (Cpt. Betty Woolsey was sidelined with an injury), the American women beat the British team and performed well in slalom at the Swiss Champion-ships. By the time the 1937 F.I.S. races at Chamonix, France were over, they were a mild sensation. In 1938 the American women, Marion in particular did an outstanding job. Marion took 1st place in a European slalom, 2nd in a downhill, slalom and alpine combines and 3rd place in another slalom. Thirteen times that winter she placed in the top ten, edging out the team captain, Betty Woolsey, whom she was beating quite consistently by this time. Marian was named to the 1940 U.S. Olympic team which was selected but did not compete because of the outbreak of World War II. It is felt that the 1940 Games might have been her best year ever on the international scene but we can merely speculate on Marian’s potential against the cream of European athletes. Marian McKean Wigglesworth was elected to the U.S. National Ski Hall of Fame in 1966. If you notice any errors or inconsistencies in Marion McKean Wigglesworth's bio, click here to let us know.